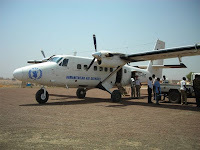 I was only back in Bentiu for a couple of weeks when out of the blue I was asked to get back on the plane to a job in the capital of south Sudan, the sleepy little town of Juba. I was told that I would act as a logistics person for the emergency vaccination campaign taking place in town. I arrived last of the team though though and so drew the short straw of being more of the administration person, trying to keep track of the 12 sites, 400 local staff and 7,000,000 diners in cash. Kind of like herding cats really. It was extremely interesting to see a mass vaccination campaign in action with long lines of people, screaming children, and the piles of materials stockpiled in the days beforehand quickly diminish. Our target population was 150,000 but the turnout in the last days dropped off a lot and I think we ‘only’ did a bit over 100,000.